In 2018 alone, the Tableau Foundation awarded over $8.8M to at least 37 grantees though Mission Grants which combine our two most valuable resources - our people and our products - along with financial support to help nonprofits demonstrate how to do good with data. Look under the "featured grants" tab in the viz above to learn more. At Tableau we have a 55% employee engagement rate, we have $1.5M in matched donations, Tableau employees have volunteered or donated to 3,038 unique organizations, and volunteered almost 38 thousand hours. This is a company culture we are honored to support. Often in these weekly posts, we choose to highlight incredible things we witness in our customer community, but I hope this reflection on the generosity we have seen from our colleagues has helped inspire you and shown you a bit more about how we do things here at Tableau. I encourage you to explore the living annual report, and if you work at or support a non-profit, maybe consider creating one of your own! 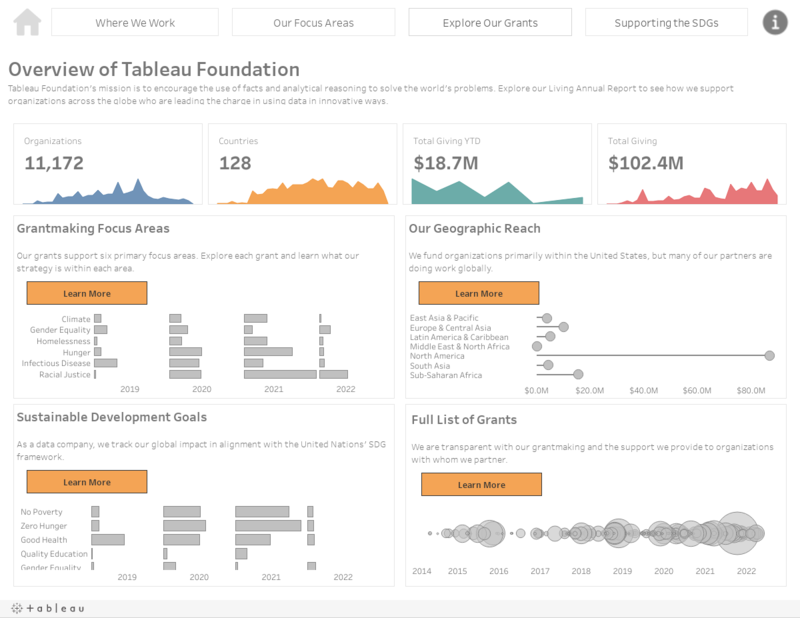 Foundation Senior Program Manager Jason Schumacher even built you a template: Build your own Living Annual Report with this Tableau template | Tableau Software Enjoy! + We hope you have had a chance to demo 2019.1 in beta, available now at our pre-release site https://www.tableau.com/getbeta Tell us what you think about Ask Data and Tableau Prep Conductor. This week an old but a goodie is topping the charts as we see Multiple Instances of Measure Names/Values Variable from long-time community leader Shawn Wallwork in with the most votes. In this idea, Shawn shared that the idea would "Allow us to create multiple instances of the Measure Names and Measure Values variables so we can assign groups of measures to one axis and a different group of measures to another axis. This would allow us to have a multi-measure line chart laid over a multi-measure bar chart without needing any Custom SQL wizardry." As much as I would like to think we all have Gryffindor prefect level wizarding skills, I have to admit Shawn's idea makes sense. If you agree, please log in to your community forum account and give it an upvote. We're watching a great conversation between forum newcomer afam okudoh, and some heavy hitters on the thread Previous Value based on From and To date . Afam asked for a little help, "I have about 8 different KPI's on my dashboard, I want to display previous values for all these kpi's based on the interval of the FROM and TO date parameter selected by the user, I already started by creating a previous date- DATEDIFF('day', [From Date], [To Date]) , I need help going further." The post includes a sample workbook and a great conversation between Afam and Zen Master Ken Flerlage. The thread remains unresolved so please feel free to join the conversation. + Ambassador Rajeev Pandey recently shared a post Stacked Onion Chart In tableau Practical blog for Viz Enthusiasts on his blog Tableau Learners. His post "sets out how to build an Onion chart without any data prep before Tableau." Enjoy! + The Data Duo of Pooja Gandhi and Adam Crahen shared a ballad of Adam's affection for Tableau and Alteryx in Tales from a COE | The Alteryx Server Usage Report meets a Tableau Zen Master. Adam's most recent blog opens with, "It’s been said (by someone smarter than me) that Tableau is the lead singer and Alteryx is everything else." You'll have to read the blog to find out more. Great work, Adam! + Ambassador David Pires asks the reader to think about whether having more data to analyze is always better in his blog post The Internet of Things and Data Inundation. Be sure to check out his examples showcasing the use of sensory data in a factory - and the use of transparent sheets and buttons. Happy prepping, vizzing, and analyzing!